Input text: The sky is black. The road is 500 feet deep. There are 12 southern magnolia trees -10 feet left of the road. The southern magnolia trees are 75 feet tall. There are 12 southern magnolia trees -10 feet right of the road. The southern magnolia trees are 75 feet tall. The woman is above the road. She is -100 feet in front of the road. She faces to the left. The camera light is black. The sun is delft blue. The ambient light is ink blue. The sun's azimuth is 10 degrees. The sun's altitude is 60 degrees. The steel gray light is 160 feet left of the woman. It is 100 feet behind the woman. The ground is ink blue. 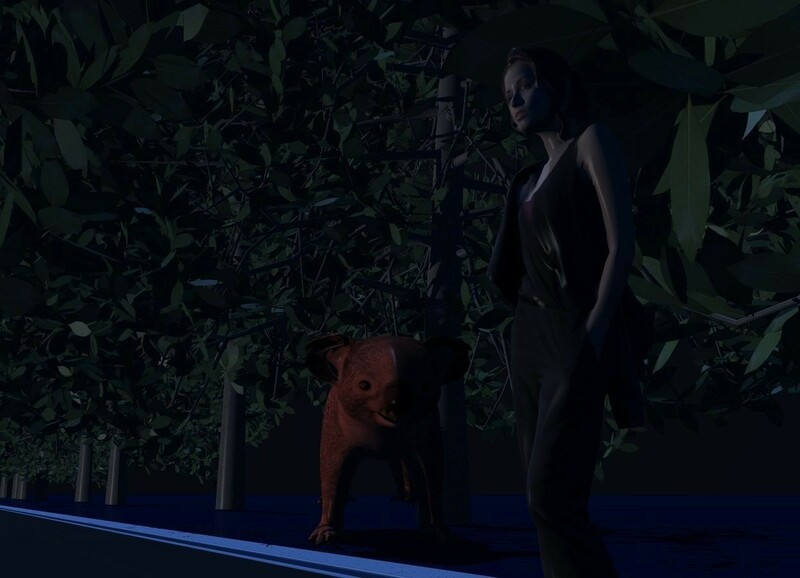 The tomato koala is 20 feet behind the woman. It is 5 feet right of the woman. It faces the woman. It is -1.5 foot above the road. It leans 7 degrees to the front. It is 9 feet tall. It is 7 feet wide. it is 30 feet deep. So mysteriously intriguing, it really draws you in.